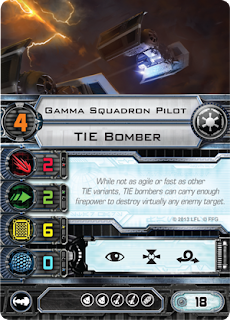 As a few of y'all pointed out to me via email, FFG has posted another preview of Wave 3 stuff, this time mainly focusing on the B-Wing and TIE Bomber. Personally, I was kinda stoked they finally chose to open up about the Bomber as we'd really not had a whole lot of info regarding it up to this point. As I've basically had nothing to talk about since like, oh, May-ish, and I gotta get another article written after this, I'm just going to talk about the Bomber today. As is the case with most Imperial starfighters, we've got two common pilots and two named pilots. So if you were wondering, the cheapest dedicated missile boat in the game so far comes in at 16 points for the base model. 6 Hull is pretty solid, but as I've discussed on here before, sticking a critical on a ship is a good way to negate at least some of its effectiveness, and TIE Bombers will be no different in that regard. Longtime readers will have heard this one before, but taking stuff to help you inflict criticals, be that a Secondary Weapon System like Proton Torpedoes, or pilots who are more likely to do a crit like Maarek aren't all that effective for their points against small ships- it's the big ships with all those hull points where those guys earn their keep. Well, the Bomber is going to fall into that category too because while it's a little ship, it has a lot of hull and no shields, so if you know your opponent is going to be fielding a few, you should bring some crit infliction just like you would if you knew he was going to be rocking a big base ship. 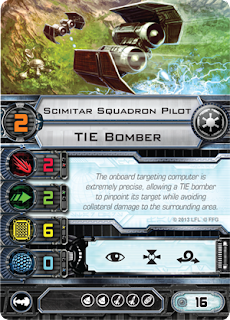 Playing as one of the common TIE Bombers, and likely firing pretty late in the combat phase, I think the idea would be to finish off somebody who was already dinged for their shields earlier in the round. Seems relatively obvious, I know, but I don't see many people roll torpedoes or missiles on low PS ships anymore. Back in Wave 1? Sure- you'd see folks roll Rookies with PTs, but now? Maybe that's just my own meta and experiences, but being as how the Bomber can't really be one-shotted with that high hull value and your opponent isn't likely to spend that first round having multiple ships fire on a relatively low cost ship like a Bomber, they are going to be pretty likely to get at least one round of their own warheads out of the tubes before anything particularly bad happens to them. Might not be a strategy you can rely on long term, but I'd bet you could catch a few people with their pants down the first month or so Wave 3 hits the bricks. So the age old question- missiles or torpedoes? I think it depends on what the rest of your list looks like. If you don't have a lot of ability to inflict crits, throw torps on your bombers, and missiles if you're just needing to score a lot of hits. How many I think is also very contextual to the rest of your list. 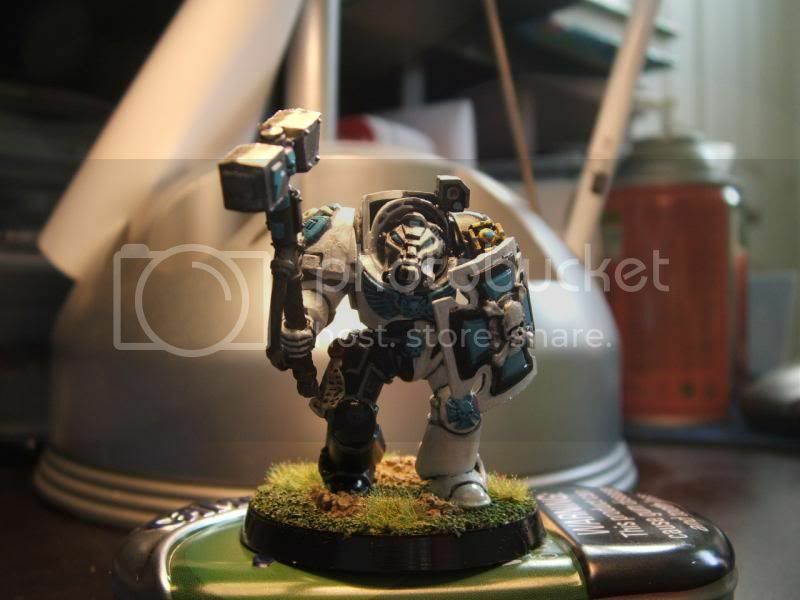 As I've mentioned before, I cut my teeth in miniatures gaming with a Space Marine 40k army, but I really came into my own as a Guard player which means I'm loathe to load down one of these ships with a ton of missiles and/ or torpedoes. That said, once those warheads are away, you're not going to accomplish a whole lot with 2 Attack and 2 Defend, so a case can definitely made for telling me to go take a flying leap with that line of thinking. Not having seen the maneuver dials for the TIE Bomber I can't say that with 100% certainty, but I'm still comfortable making the statement as I'd guess the Bomber has a wheel somewhere between an X-Wing and a Y-Wing, likely trending more towards the Y. My advice? Take one set of warheads for sure, then if you've got 4 or 5 points left to burn after picking the rest of your ships, throw another set on some lucky pilot. 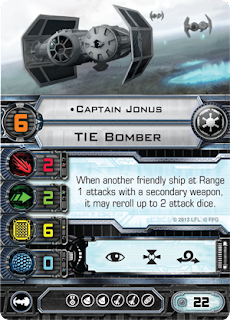 The named pilots for the Bombers are Major Rhymer and Captain Jonus. Awright, so 22 points for a PS 6 Bomber with one hell of a special ability. Sounds great to me. 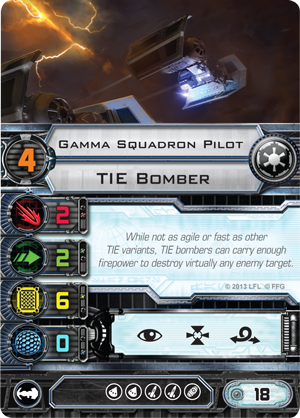 Once again- if you haven't already realized, like I said over on BoLS last week, the TIE Bomber is going to be the sell out ship of Wave 3, y'all. Remember how tough it was to get an Interceptor back in April? The Bomber's gonna be the same way. One apparent application is to stick him with a ton of other Bombers and watch the hits roll in. TIE Swarm players gotta be lickin' their chops over this guy because he's more or less Howlrunner for Secondary Weapon Systems and then some. That said, if you've got the points to fly Trelix or Kath Scarlet along side this dude? Boy oh boy, somebody's in for a hurtin'. Oh, did I mention he can also take an Elite Pilot Skill? 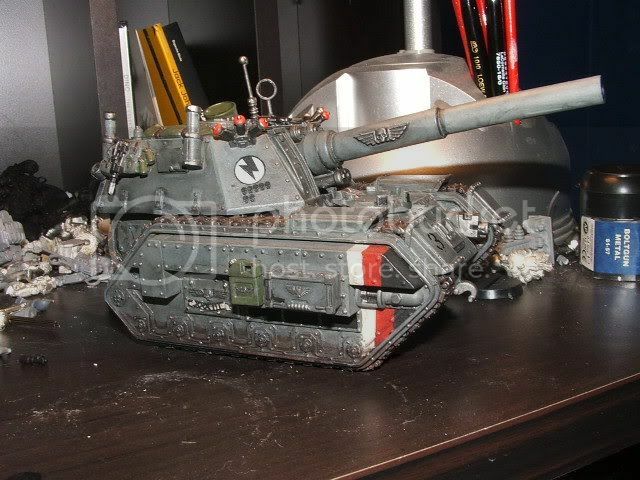 Jonus gonna be carryin' more than just the wheel in a lot of Imperial lists. Believe 'dat. The other named pilot guy is sure to become my favorite X-Wing Miniatures pilot bar none. Yeah, maybe even in front of Turd Ferguson. 2) The various and sundry other nicknames for Chuck D, eg., "Ok, the rhyme animal, the young cannibal, D, public enemy number one is going to attack Green Squadron Pilot..."
Opportunities for rappin' aside, D ain't a bad ship. At 26 points he's not exactly cheap, but his card text virtually assures the ability of using any Secondary at any range. Sure, you're not going to get an extra die if you get into Range 1, but you do get to fire torps or what have you, which is of course, generally not the case. This is one time I'd break my rule of not putting a bunch of points into a single ship- if you're looking for something to change up that small quantity, elite pilot Imperial list you've been messing around with during Wave 2 and are slightly bored with, I think the Hard Rhymer would be fun to sub in. Deck him out with some warheads of your choosing, stick an Elite Pilot Skill on there (Marksmanship could be fun, for sure) if you're feelin' froggy and you've got the points and force your opponent to make that hard choice- do I try to go after Turr Phennir, Vader, or MistaChuck? Trelix, Backstabber, Mauler Mithel, or the guy who's blowin' up the 90's but started tickin' in '86? You catchin' my drift? 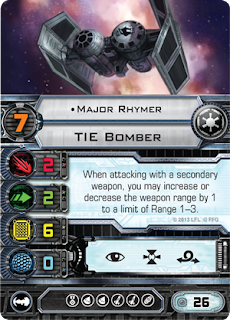 So for the TL;DR crowd who wandered over here from BoLS and have no appreciation for my flow, TIE Bomber good- buy one. Actually buy several. And remember folks, TL;DR really only works on messageboards- you clicked on the article, knucklehead. It ain't like I've got super-important, earth-shattering information you need to know before the apocalypse hits or I hid some amazing nugget of truth you just can't live without in the last line or whatever. You think it's too long? Stop readin' it, dipshit. Ain't nobody keepin' you from hittin' the back button. Some BIG News Out of GenCon!